Brusquembille - thanoscardgamess jimdo page! Brusquembille is a trick taking game - that is, the object of the game is to take cards which gives you (or your team) a high score. It is played since 17th century in France, and it is also known in Greece as Skambili and in Turkey as Iskambil. 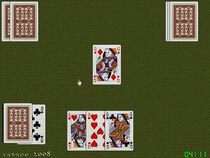 Aces and Tens are called Brusquembilles. The main strategy is to lead effectively the Brusquembilles, and gain tricks, while preventing your oppontents to do so.